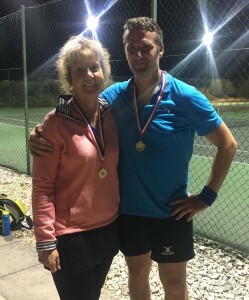 A magnificent 22, with 11 ladies and 11 men, took part in the Mixed Partners Drawn tournament on the evening of Thursday 10th August. Maybe it was the promise of a pub curry afterwards that encouraged the entries to roll in – definitely worth trying this tactic again! Maria was the organiser on the night and the partners were duly drawn at random and placed into two round robin groups – so plenty of tennis was played by all. The winners and runners-up of each group played semi-finals matches with Maggie & James defeating Rosanna & Charlie and Jacqui & Steve overcoming Laura & Paul. 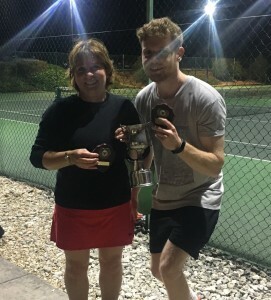 The Medan Cup was presented to the worthy winners, Maggie & James, after a close fought final against Ja cqui & Steve.